1) To create this ombre / mixed mani look, I used three coats of Wet ‘n’ Wild’s Wild Shine Nail Color in Lavender Crème (the dark pink), and three coats of Wet ‘n’ Wild’s Wild Shine Nail Color in Tickled Pink. I then added one coat of Seche Vite Fast Dry Top Coat on top of all colors for added shine and protection. Ring via Forever 21. 2) This was created using three coats of Mary Jo Matsumoto’s 4FREE Nail Color in Laguna Shimmer. I think this is really meant to be a top coat for a hint of shimmer to another nail color; however, I loved it so much that I decided to make it opaque by using multiple coats to create an icy glitter shade (that is far prettier in person BTW). I did not use a Top Coat for this look. Ring via unknown. 3) This look was created using three coats of Wet ‘n’ Wild’s Fast Dry Nail Color in Sagreena the Teenage Witch, topped with one coat of Seche Vite Fast Dry Top Coat. Aside from Essie’s Mint Candy Apple (which I don’t consider to be a true green), this was my first encounter with green nail polish (purchased for the name, because I am a huge fan of Sabrina the Teenage Witch), but it has quickly grown to be one of my favorite colors. So, even if you don’t think you will like green polish, I highly recommend giving this color a try. 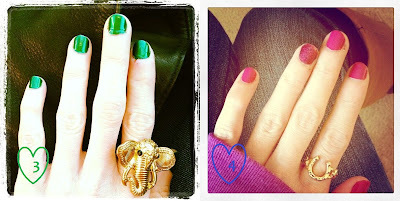 Elephant Ring via Forever 21 – similar style here. 4) To create this lacquer look, I used three coats of Forever 21 Love & Beauty Magnetic Magenta Nail Polish in Fuchsia on all nails, then added one coat of Forever 21 Love & Beauty Blue Purple Glitter Nail Polish in Blue / Purple to the ring finger, and topped all fingers with one coat of Seche Vite Fast Try Top Coat to finish it off. House of Harlow 1960 14KT Horseshoe Stack Ring in Yellow Gold. How pretty! Love the first one because I do like to use 2 or 3 different colors..sometimes. I love the ring too. I'm finding I get the most wear out of wet n' wild's megalast. I'm wearing "bite the bullet" at the moment. Such amazing rings in this post! This was so fun to start my Monday this way. I just got Sally Hansen's SMOOTH Perfect in ice, but reluctant to wear it. I'll have to use so many coats of it. Some colors look better in the bottle than on my fingers. I prefer the lighter shades of polish, like the light pink in the first picture. The pale colors have a way of elongating the fingers. oh I love all of the colors! Wow, I am so lazy when it comes to polish, haha. I shall have to try some of these. I love fancy manicures like these. I just lack the skills needed to replicate them! You have some of the best rings I've ever seen. I must pay more attention to Forever 21's ring collection. Very pretty! I'm wearing Ivy from Zoya today. Kind of a toned down red with gold flecks. Shoot, that anonymous comment was me lol. Oops! I need a mani, stat! Such delicate dancer hands you have! Ah I just love that green nail polish. So wicked. You're so creative, Erika! I love the pink ombre one. one of my things to do this weekend was paint my nails. that didn't happen. but these bright colors are making me want to! Love this Erika, and thanks for adding Laguna Shimmer (which sadly sold out in the first week we got it) to your mix! Hope you'll try our new trios for SS12. I'm wearing our 4FREE Tangerine Twinfin today. Gorgeous nail colors. I think 3 is my favorite...you don't see green nails very often! We both have the same Hope ring from F21, and I love that Laguna Shimmer nail color in look 2. This is so fun. Love the colors. I need nail polish inspiration! love the blue glitter nails! gorgeous! I love all 4 of these. This was so cool know how many coats you use too. That green colour is beautiful. I love it! I love those blue knails ! And such a great blog! :-) keep it going ! 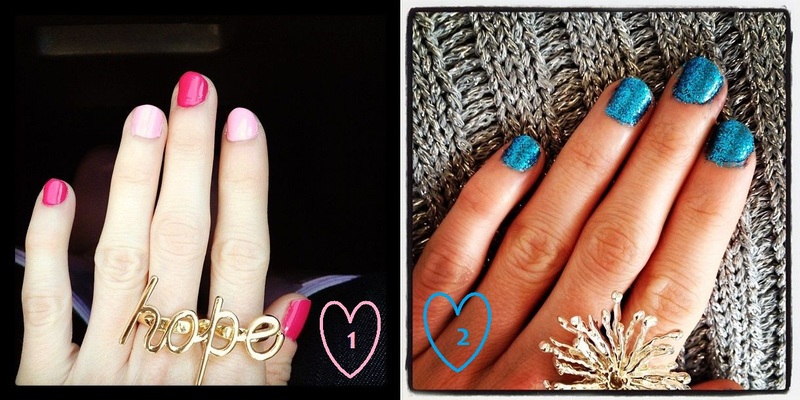 Love your nails and rings! Adore polished nail. I am in love recently with Chanel Peridot. I LOVE that blue color! I am so into blue nails right now.